A pioneer in its field, the Center for Media Literacy (CML) is an educational organization that provides leadership, public education, professional development and evidence-based educational resources nationally and internationally. Dedicated to promoting and supporting media literacy education as a framework for accessing, analyzing, evaluating, creating and participating with media content, CML works to help citizens, especially the young, develop critical thinking and media production skills needed to live fully in the 21st century media culture. The ultimate goal is to make wise choices possible. The Center for Media Literacy (CML) is dedicated to a new vision of literacy for the 21st Century: the ability to communicate competently in all media forms as well as to access, understand, analyze, evaluate and participate with powerful images, words and sounds that make up our contemporary mass media culture. Indeed, we believe these skills of media literacy are essential for both children and adults as individuals and as citizens of a democratic society. Our mission is to help children and adults prepare for living and learning in a global media culture by translating media literacy research and theory into practical information, training and educational tools for teachers and youth leaders, parents and caregivers of children. Media literacy is education for life in a global media world. For 500 years, since the invention of moveable type, we have valued the ability to read and write as the primary means of communicating and understanding history, cultural traditions, political and social philosophy and news of the day. In more recent times, traditional literacy skills ensured that individuals could participate fully as engaged citizens and functioning adults in society. Today families, schools and all community institutions share the responsibility for preparing young people for living and learning in a global culture that is increasingly connected through social media, multi-media and influenced by powerful images, words and sounds. The heart of media literacy is informed inquiry. Access information from a variety of sources. Analyze and explore how messages are "constructed" whether through social media, print, verbal, visual or multi-media. Evaluate media's explicit and implicit messages against one's own ethical, moral and/or democratic principles. Express or create their own messages using a variety of media tools, digital or not. Media literacy is an alternative to censoring, boycotting or blaming "the media." Deeply committed to the First Amendment and freedom of expression, media literacy does not promote partisan agendas or political points of view. The power of media literacy is its ability to inspire independent thinking and foster critical analysis. The ultimate goal of media education is to make wise choices possible. Embracing this philosophy, the Center for Media Literacy is committed to media education as an essential and empowering life-skill for the 21st Century. 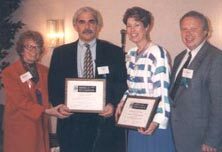 Marieli Rowe (left) and Marty Rayala (right) of the National Telemedia Council present awards of appreciation for advancing media literacy in the USA to Alan Levitt, director of the White House Office of National Drug Policy and Elizabeth Thoman, CML president and Chair of the 1996 National Media Literacy Conference. For over 30 years, CML has been a national, even international, voice explaining the importance of media literacy in today's culture and promoting its adoption by schools, afterschool programs, libraries, churches and community centers. The Center for Media Literacy was founded by Elizabeth Thoman, a Roman Catholic sister, in 1989 as a nondenominational, nonpartisan organization. With a focus on research and development, we have helped define the media literacy field and set a standard for the practice of media literacy education. Our evidence-based framework for media literacy education serves as a foundation for media literacy education throughout the world, and our CML MediaLit Kit utilizes a methodology for teaching critical thinking about media that is consistent, replicable, measurable and scalable. We have provided fact sheets and information kits, news media interviews, blogs, articles, publications and reproducible resources designed to interpret and articulate the importance and promise of media literacy education in the United States and abroad. Our website has served millions of people throughout the world with credible and pertinent information on media literacy. CML provides public education primarily through the development of this comprehensive website, providing its CML MediaLit Kit and covering current issues and topics, articles and reports, cases and implementation advice, resources for teaching, and information about training opportunities and activities in the media literacy field. Our Reading Room contains more than 1,000 pages of current and historical articles on media literacy. The basic framework outlined in CML's MediaLit Kit™ serves as the basis of all CML's leadership work, according to our philosophy of "empowerment through education." CML president Tessa Jolls leads a seminar at the National Conference. Through consulting and speaking engagements, CML provides inspiration, guidance and information about the media literacy field, basic media literacy pedagogy, and specific implementation of change management strategies and programs. CML has pioneered more than two dozen model workshops for introducing teachers to the world of media literacy education, including theory/pedagogy, classroom practices, and topical areas like citizenship and stereotyping, violence in the media, tobacco and alcohol advertising or race/gender issues in today's media culture. As the demand for trained and experienced media literacy practitioners increases, the need for professional development and training opportunities also continues to grow. Furthermore, implementation programs which feature research-based approaches are critical to the development of the field, and CML is a leader in demonstrating how media literacy works in both producing and in understanding media. CML MediaLit Kit, updated regularly and originally produced in 2002, provides a basic framework for media literacy and a collection of foundational resources - videos, handouts, activities and curricula - that can be used in classrooms, teacher in-service training or community education to explore the key questions and core concepts in the media literacy field. Working with developers, producers or authors, CML originates new resource materials designed to meet the evolving needs of teachers and leaders in schools, churches, religious and community agencies. CML provides leadership, teacher training and implementation programs, public education, plus publication and distribution of teaching resources for the media literacy field - locally, nationally and around the world. In 2018, CML partnered with Connecticut Public's Thinkalong program, to help students think critically about media and conduct respectful civic dialogues. In 2017-2018, CML helped design and implement community engagement projects in partnership with California State University Northridge, and with public and university libraries to demonstrate how service learning and media literacy work together towards civic participation. In 2016, CML designed and implemented five-day Media Literacy Institutes to train faculty and administrators in CML's methodology for using evidence-based frameworks to develop curricula and lessons. In 2015, CML helped organize the first National Media Literacy Week celebration in Los Angeles, and hosted the Korea Press Foundation Delegation. In 2015, CML redesigned and relaunched its website and added a new collection of articles and activites with more than 60 Connections newsletters. In 2014, CML introduced a project-based learning curriculum featuring a production approach utilizing web-based resources, called Breakfast Epiphanies: Project-Based Learning with Media Literacy and Nutrition. In 2013, UCLA's longitudinal evaluation of CML's framework and curriculum, Beyond Blame: Challenging Violence in the Media, was published in a medlined peer-reviewed journal, Injury Prevention, detailing how student knowledge was increased as well as attitudes and behaviors positively affected. In 2013, Elizabeth Thoman donated her archives to the University of Rhode Island, making them available to scholars throughout the world. CML also published its tobacco cessation curriculum, Smoke Detectors! All of CML's curricula are piloted and classroom-tested in multiple locations before release, with assessments of students performance. In 2011, CML published its Voices of Media Literacy project, which features first-person interview with 20 international pioneers of media literacy. In 2012, CML completed its comprehensive, systems-based approach to curriculum development, a toolkit called Media Literacy: A System for Learning AnyTime, AnyWhere, and launched its updated, research-based Middle School curriculum and professional development module for violence prevention called Beyond Blame: Challenging Violence in the Media. Additionally, a nutrition education/media literacy curricula and professional development module, Media Literacy: A Recipe for Action, was released after being tested in U.S. several locations. In recent years, CML provided training and implementation consultation to Medios Claros, a media literacy advocacy organization in Lima, Peru; to Internews in Bosnia-Herzogovina; to the Korea Press Foundation; and provided workshops and speaking engagements for organizations world-wide. In 2007, CML introduced Questions/TIPS, a new framework for analysis in both deconstructing and constructing media messages. Q/TIPS™ is a central feature of the Second Edition of CML's landmark book, Literacy for the 21st Century: An Overview and Orientation Guide for Media Literacy Education, published in 2008. In 2002, CML introduced its CML MediaLit Kit™, a framework for teaching and learning in a media age. The MediaLit Kit™ is based on the thinking and writings of leading academics and practioners in media literacy over the past 50 years. In collaboration with the Los Angeles Unified School District, the Education Division of the Music center of L.A. and AnimAction, Inc., the Center received in 2001, one of 17 demonstration media literacy and the arts grants awarded by the U.S. Department of Education and the National Endowment for the Arts. The 3-year project, titled Project SmartArt, provides a range of media literacy opportunities for teachers and students in inner city LA. CML is a founding organizational member of the Alliance for a Media Literate America (AMLA), a national membership organization chartered in 2001 to organize and host the National Media Education Conference every two years and to promote professional development in media literacy education in the USA. In 1999, Tessa Jolls joined CML as president, partnering with CML's Founder Elizabeth Thoman. In 1996, CML hosted 350 teachers and leaders at the Second National Media Literacy Conference in Los Angeles which, along with the 1995 conference in Boone, NC, established the precedent and framework for national conferences in the media literacy field. Through the Felton Media Literacy Scholars Program, established in 1997 with a major gift from television pioneer Norman Felton, CML has established a national model for teacher training in the field of media literacy education. Hundreds of Southern California teachers have participated in CML's training events. Hundreds of teachers attended CML's former Crash Course in Media Literacy which was held periodically at the Center or as in-service programs arranged by educational organizations, such as the California Association of Independent Schools, Catholic Archdiocese of Los Angeles, Bureau of Jewish Education and numerous public school districts throughout Southern California and around the country. CML's pioneering curriculum, Beyond Blame: Challenging Violence in the Media, first published in 1995 with grants from the Carnegie Corporation and other foundations, is the most comprehensive teaching package available on the subject. Acclaimed by teachers as well as media professionals, the program has units for Elementary, Middle School, Teens and Parents plus a Community outreach component. From 1991-1995, CML created the first generation of teaching tools about the media published in the U.S., including: How to Analyze the News Media, Parenting in a TV Age, Break the Lies that Bind/Sexism in the Media, Citizenship in a Media Age and TV Alert: A Wake-Up Guide to Television Literacy. Elizabeth Thoman founded CML in 1989, building upon her work with the Center for Media & Values, publisher of Media&Values Magazine. Elizabeth Thoman, Founder. Elizabeth Thoman, media literacy pioneer, passed away in December 2016. This page has been updated with tributes to Elizabeth Thoman, in memoriam. Technical and Administrative Team: CML retains a full complement of technical and administrative professionals who contribute to the development and maintenance of the CML website and ongoing operations. Tessa Jolls is President and CEO of the Center for Media Literacy, a position she has held since 1999. She also founded the Consortium for Media Literacy, a nonprofit which provides research and a monthly newsletter publication. During her tenure at CML, Jolls' primary focus is working in partnership to demonstrate how media literacy works through school and community-based implementation programs. She actively contributes to the development of the media literacy field internationally through her speaking, writing and consulting, with curriculum development and research projects, and through publishing and disseminating new curricular and training materials. Jolls has recently co-chaired two leading initiatives: the formation of the North American Sub-Chapter for the Global Alliance for Partnerships in Media and Information Literacy (GAPMIL), a UNESCO initiative, and the Digital and Media Literacy Working Group, organized through the Children and Screens Initiative which resulted in a Pediatrics paper recommending research and policy priorities for the field. Among other initiatives, in 2016, Jolls organized the Commit 2 MediaLit! Campaign to recognize Media Literacy Week. In 2015, Jolls received the Global Media and Information Literacy Award, in recognition of her work in Media and Information Literacy and Intercultural Dialogue, from the UNESCO-initiated GAPMIL, in cooperation with the United Nations Alliance of Civilizations (UNAOC). 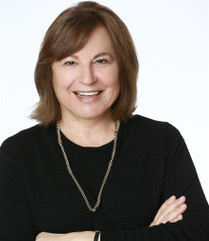 In 2014, Jolls was honored with the International Media Literacy Award by Gateway Media Literacy Partners; in 2013, she was recognized with the Jesse McCanse Award for Individual Contribution to Media Literacy by the National Telemedia Council. She was invited to attend the Stanford Graduate School of Business Executive Education, WICT Senior Executive Summit in March, 2018. She created the concept, co-authored and published the CML MediaLit Kit, a collection of media literacy resources featuring professional development and curricular materials. These resources all center around CML’s research-based framework for media literacy education, which is recognized world-wide as an “onramp” for teaching and learning that is consistent and can be replicated, measured, evaluated and scaled. Works from the CML MediaLit Kit have been translated into Spanish, Arabic, Turkish, Portuguese, Korean and Bosnian. CML’s comprehensive Trilogy, called Media Literacy: A System for Learning AnyTime, AnyWhere provides the basics for educators interested in change management and the new role of media librarians in schools, as well as for integrating media literacy throughout the curriculum through media deconstruction (“reading”) and construction/production (“writing”). Jolls has designed and delivered training and professional development programs internationally. She designed the new curricular structure and led CML’s multi-year implementation effort to test and implement its revised middle-school violence prevention curriculum, Beyond Blame: Challenging Violence in the Media. CML’s longitudinal study, done with UCLA’s Southern California Injury Prevention Research Center, evaluated both the effectiveness of its framework and Beyond Blame: Challenging Violence in the Media. The study was published in 2013 in Injury Prevention, a peer-reviewed journal. This landmark study showed positive results for students’ acquiring knowledge and changing attitudes towards violence, as well as for behavioral changes in regards to use of media and in a lessened rise in aggressive behaviors. Similar curricular structures are employed in CML’s other health curricula: Breakfast Epiphanies (published in 2014), Smoke Detectors! (published in 2013) and A Recipe for Action (published in 2012). CML’s health curricula meet Common Core Standards for language arts. During 2009-2010, Jolls piloted (at three schools) online multi-media professional development modules and curricula with interactive media technology platform featuring nutrition education that met technology, language arts and health education standards for middle school. In 2009, Jolls designed and implemented professional development programs for four schools in Lima, Peru in conjunction with Medios Claros, a nonprofit Peruvian service organization, as well as for a private Midwestern school for girls. From 2001-2005, she led efforts to gain and implement first federal demonstration grant for media literacy with Project SMARTArt, in partnership with LA County’s Music Center Education Division and Los Angeles Unified School District. She served as project manager and coordinating partner, as well as organizer of Education Forum to report findings at Walt Disney Concert Hall. During 2004-2007, Jolls was engaged by LA Nutrition Network and Youzeum in Missouri to provide nutrition-related programs, and the Museum of Tolerance to provide two full day media literacy institutes. She assisted the Oregon State Fire Marshall’s Office with curriculum design. She secured a state grant for “Smoke Detectors” on smoking prevention from Orange County Health Care Agency in 2003. "Media Literacy: A Foundational Skill for Democracy in the 21st Century," by Tessa Jolls and Michele Johnsen, Hastings Law Journal, June 2018. "Developing Digital and Media Literacies in Children and Adolescents," by Kristen Hawley Turner, Tessa Jolls, Michelle Schira Hagerman, William O'Byrne, Troy Hicks, Bobbie Eisenstock and Kristine E. Pytash, Pediatrics 2017. "Radicalization in Cyberspace: Enlisting Media and Information Literacy in the Battle for Hearts and Minds," by Tessa Jolls and Carolyn Wilson, MILID Yearbook, 2016. "The New Curricula: Propelling the Growth of Media Literacy Education," Journal of Media Literacy Education, Aug. 2015. "Media and Information Literacy Education: Fundamentals for Global Teaching and Learning," by Carolyn Wilson and Tessa Jolls, MILID Yearbook, 2015. "A Personal Credo for a Literate Global Society," Journal of Media Literacy, 2015. "The Core Concepts: Fundamental to Media Literacy Yesterday, Today and Tomorrow," by Tessa Jolls and Carolyn Wilson, published in the Journal of Media Literacy Education, Nov. 2014. "The Value of Media Literacy Education in the 21st Century," by Tessa Jolls and Henry Jenkins, published in Jenkins' blog "Confessions of an ACA Fan," Sept. 2014. "Media Literacy: A Global Imperative," by Tessa Jolls, published in the Russian-American Education Forum, May 2014. “Voices of Media Literacy,” by Tessa Jolls, Barbara J. Walkosz and Dee Morgenthaler, published in Media Literacy Education in Action, Edited by Belinha S. DeAbreu and Paul Milhailidis, Dec. 2013. “Evaluation of a school-based violence prevention media literacy curriculum,” by Kathryn R. Fingar and Tessa Jolls, Injury Prevention, Aug. 2013. “Media Literacy: Change Management,” by Tessa Jolls, e-book published at www.medialit.com, 2012. Media Literacy: Deconstruction/Construction, by Tessa Jolls, e-book published at www.medialit.com, 2011. “The Impact of Technology on Character Education,” by Tessa Jolls, presented at Character Education Symposium sponsored by U.S. Dept. of Education, Safe and Drug-Free Schools, Aug., 2008. “Globalocal: Media Literacy for the Global Village,” by Tessa Jolls, Barbara Walkosz and Mary Ann Sund, presented at International Research Forum for OfCom in London, 2008. “The Media is the Message: Invasive Messages Require Defensive Teaching,” by Grace Rubenstein, Edutopia Magazine, Aug.-Sept. 2008. “What’s on the Menu? Linking Media Literacy, Nutrition and Consumerism,” by Regina Cabrera, Middle Ground: the Magazine of Middle Level Education, Vol. 10, No. 4, April 2007, p. 42-43. Feature story on CML nutrition program designed and delivered by Tessa Jolls. “Project SMARTArt: Innovative Strategies for Teaching Media Literacy and the Arts,” by Tessa Jolls and Denise Grande, U.S. Dept. of Education, May 2005, Arts Education Policy Review, Sept.-Oct., 2005. “An Overview of the Center for Media Literacy,” by Elizabeth Thoman and Tessa Jolls, Yearbooks of the National Society for the Study of Education, with theme of “Media Literacy: Transforming Curriculum and Teaching,” Blackwell Publishing, December, 2004. “Media Literacy: A National Priority for A Changing World,” by Elizabeth Thoman and Tessa Jolls, American Behavioral Scientist, Vol. 48, No. 1, Sept. 2004. CML President, Tessa Jolls, explains the Five Key Questions for media literacy in this YouTube video. Michele is a Fellow of the Center for Media Literacy (CML) and president of the strategic communications company Ignite Global Good, LLC, a CML affiliate company located in Los Angeles. She is an award-winning communications expert who specializes in media literacy, social change, human rights and public diplomacy. She works in all aspects of her field, including strategic planning; media relations; digital media; special-events; crisis communications; brand management; internal communications; and internet, video and print content development. Michele’s media literacy work includes leading workshops and trainings at UCLA, UC Irvine and a variety of organizations that promote social good. She has also worked as a multimedia documentary journalist. Her project, "Almost All-American," was featured on KQED’s California Report and in The Global Post. Her human rights advocacy work includes presenting at the US Embassy in Bogotá, Colombia on the subjects of indigenous land rights and security; leading the human rights team for the USC Master of Public Diplomacy International Research Team in Indonesia; and contributing research to a 2016 Human Rights Watch report on water rights in rural Bangladesh. Along with more than two decades of communications strategy and messaging experience, Michele holds a Master of Public Diplomacy degree from the University of Southern California’s (USC) Annenberg School of Communication and Journalism. Her studies include research on international and domestic communications tools and techniques, including propaganda used during the Cold War era. Complementing her strategic abilities and creative vision, Michele’s writing and production talents have earned her an IABC Gold Quill Award, an IABC Silver Six Award, an APEX Award for Publication Excellence and an Orange County Register Golden Pen Award. She was also a guest instructor at UCLA on crisis communications planning for non-profits and executive media interview training.